"Discover How Fun And Easy It Is To Play Blues Guitar, Even If You Don't Know A FretBoard From An Ironing Board!" “Those who can’t do, teach… "
“Absolutely The Way To Go…” When I heard that Griff had put together a beginner’s course, I jumped at the chance to get it. I was not disappointed. 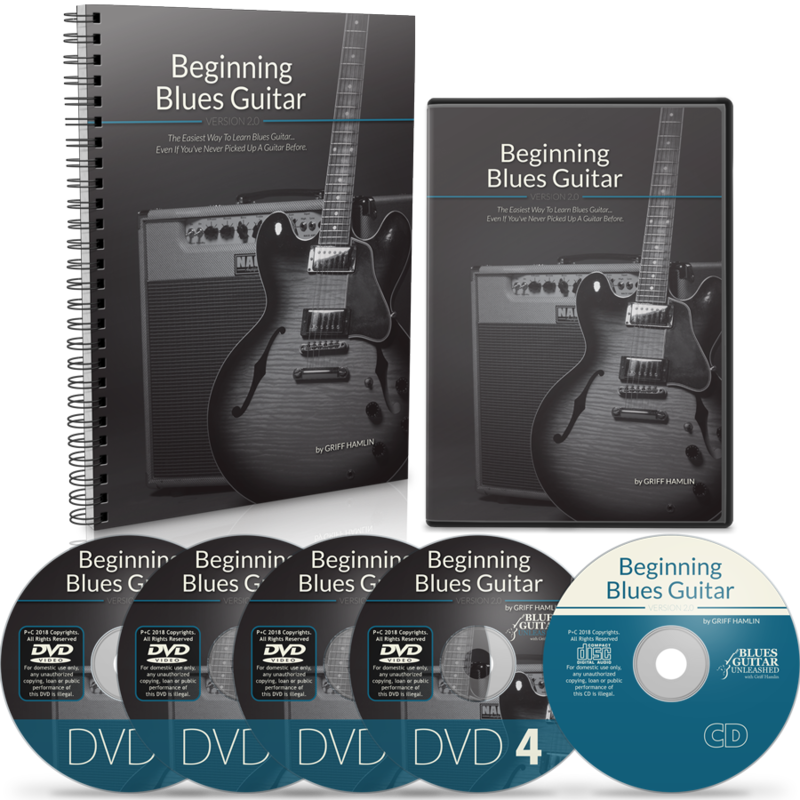 This complete system will take you from Absolute Beginner to Respectable Blues Guitar Player over the course of 27 easy-to-follow lessons. Here is another one of the unaccompanied tunes that you'll learn... these are great when you just want to play for yourself or someone else and you don't want to have to mess with a band or any backing tracks. And while there aren't many things that scare a guitar player more than barre chords... I promise you they aren't nearly as difficult as they are made out to be if you know how to approach them. We'll cover them extensively so that you know ALL of the chords you'll need for years to come. You be the judge. 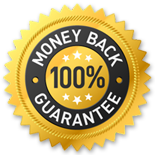 If this program doesn’t deliver everything I’ve promised, or if you’re unhappy with it for any reason, just let me know and I’ll immediately refund every penny, no questions asked. Oh... and you don't even have to send it back... how's that for reasonable? So I want to make this a total “no-brainer” for you and offer it to you today for only $147 $117 $87. 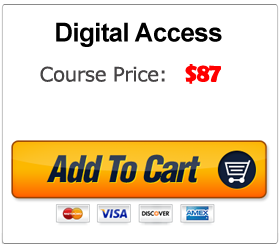 That’s all of the video lessons, the play along tracks, the complete manual with every single note written out in painstaking detail… a minimum of 6 months of private guitar lessons packed into Beginning Blues Guitar for just $87. You simply login to your secure member portal once you complete your purchase and it's all right there for you, forever, there is no limit and you can come back any time, you can download it to your own computer - whatever you want to do, it's yours. And if you'd like me to print out the manual or send you DVDs, I can do that do for the cost of the materials. 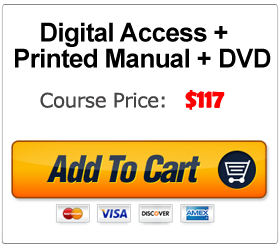 If you choose to have the Manual or DVDs sent, you still get the digital version no matter what. A.It’s a cinch. You’ll have my email address if you need to get in touch with me. All you do is let me know. I’ll happily refund your money if it’s not for you. 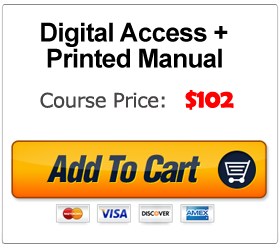 Simply click the giant “Add To Cart” button below to get started learning blues guitar today, and choose your delivery method. Your order is completely secure, and you have my personal 365 Day Satisfaction Guarantee. No guitar teacher anywhere can match that kind of promise. As soon as you complete your order, you'll receive an email with login instructions to get started. You can be playing the blues in just a few minutes from right now! To get your copy of Beginning Blues Guitar just click the yellow “Add To Cart” button below with your preferred delivery method. Within moments of your order being complete you will receive access instructions to the Member Portal via email. So you can be playing the blues in just a few minutes from right now! P.S. 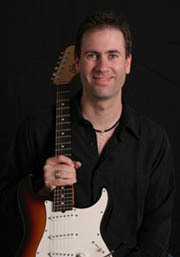 - Many of the students who had a hand in the creation of Beginning Blues Guitar were exactly where you are today. The problems they faced and the information they needed is what drove me to put this all together in one package. You won’t find a more complete guide to learning blues guitar anywhere. P.P.S. - I personally guarantee your success, you have absolutely nothing to lose. You simply will not find a better way to learn to play blues guitar.